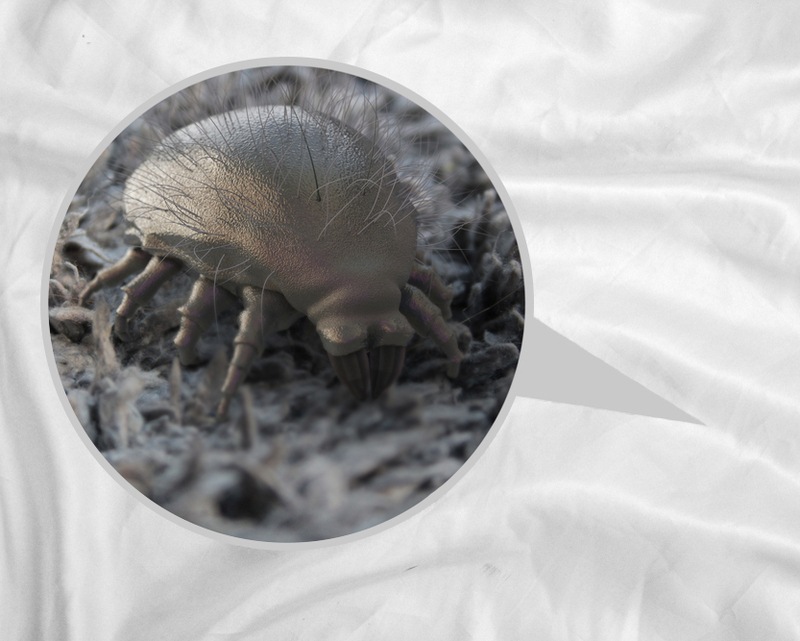 Dust Mites Live In Your Bed & Breathing In There Excrement Is Making You Sick. It's true. Your mattress is home to millions of microscopic arachnids feasting on your skin. We're talking about dust mites, the disgusting cousin to Ticks & Spiders. Dust mites live off of your dead skin, providing food for millions. The Hypoallergenic Bedding Protector prevents these bugs from invading your bed and stops contact with the creatures altogether. The fabric is designed to prevent and repel dust mites while maintaining a comfortable and breathable sleep. The Bedding Protector also prevents mildew, bacteria, bed bugs and more! One female dust mite has a lifespan of 70 days and produces over 100 eggs in 21 days. Their feces produce antibodies in Humans which causes a myriad of symptoms when inhaled. If you've experienced these symptoms, the Hypoallergenic Waterproof Bed Protector will help you. You will notice your health, energy levels, sleep, and mood improve within a few nights. Providing you with peace of mind. The bedding works by having tightly woven Polyester fabric. The polyester is woven so tight that it prevents these flesh-eating arachnids from invading your bed and stops them instantly from feasting on you or your child during sleep. Since the protector is cutting dust mites off from their food supply, you. It makes it impossible for them to breed, feed or live in your mattress. But it doesn't only prevent dust mites, it eliminates the possibility of mildew, bed bugs and other festering pests from disturbing your peaceful nights.